6. Clasp your hand together over the center of your chest. Interlace your fingers and hold the Athame between your knuckles, pointing upward. Extend your elbows horizontally, alone the plane of the horizontal shafts of Light, extending from the stars at your shoulders. 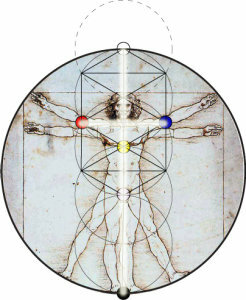 Visualize yourself, standing at the centre of a blazing Cross of white Light, which extends to the ends of the Universe, and you vibrate A-MEN. (I ACCEPT) You have taken your rightful responsibilities into your own hands.